With the occasion of my participation at the HTMlles Festival in Montréal, in the context of the conference on Festival Sustainability (see here), I will be in town for one week and give some lectures on November 12, and 13, 2014. In this talk I will analyse and present techniques of networking developed in the expanded, pervasive and collective networks in the last half of the twentieth century in Italy and beyond, which have anticipated the structure and inspired the rhetoric of many of the contemporary commercialised social networking platforms. The main focus are the diverse use of art and technology among grassroots communities of artists, hackers and activists. 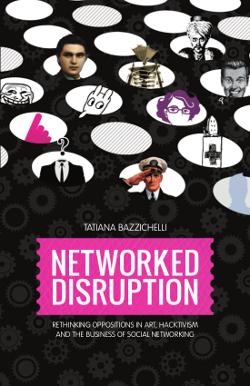 I will describe the concept of Business Disruption as an art practice which draws upon my book Networked Disruption: Rethinking Oppositions in Art, Hacktivism and the Business of Social Networking (download here), DARC Press, Aarhus University, 2013. The aim is to analyse hacker and artistic practices through business instead of in opposition to it. The analysis poses the following question: Is it possible to respond critically to business without either being co-opted by it or refusing it? Is criticism only possible through opposition? The event is sponsored by Concordia University Research Chair in Mobile Media Studies. More info here.